This chandelier is an excellent example for Hoffmanns way from the geometrical reduction - started 1901 by him, to the neoclassical direction, which he started, circa 1909, on the works for the Stoclet Palais in Brussels. 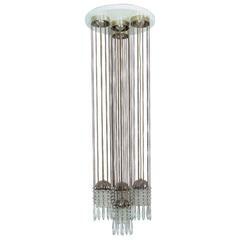 Both styles are merged in this chandelier. For the residence of the Banker Dr Dietrich Moldauer Material: Patinated brass, Silk, all other colours are possible. Literature: Sekler, Josef Hoffmann – Das architektonische Werk, Salzburg und Wien 1982, S. 476; Josef Hoffmann, Wohnung Baron Dietrich Moldauer, Wien I., Opernring 19, Publikation Sonderanfertigung. The Austrian architect Josef Hoffmann was a central figure in the evolution of modern design, and a leader in an aesthetic movement born in Europe in the late 19th century that rejected florid, extravagant ornamentation in favor of a new emphasis on simplicity of line. As a founder of the turn-of-the-century Wiener Werkstätte (in English: the Viennese Workshops), a design cooperative that produced superbly crafted furniture and housewares, Hoffmann was a pioneering practitioner of what would become a fundamental principle of modernism: that good design is a way of life. Hoffmann came of age amidst a shift in the culture of the applied arts, as a conservative order that looked only to the past for inspiration was pushed aside. But what, exactly, would replace that order was in question — and Hoffmann’s career embodies the developing patterns of design’s new spirit. His architectural work reflects his time as a student of the Vienna architect Otto Wagner, who disdained excessive decoration and employed new materials such as steel girders and reinforced concrete to create buildings with airy, open interiors full of light. As a designer of furniture and interiors, Hoffmann was consistently open-minded about the aesthetics he explored. He was an early adherent of the flowing, organic forms of the Art Nouveau design movement that began to flourish in the late 1880s — but by the opening of the Wiener Werkstätte in 1903, Hoffmann’s designs embraced the beauty of geometry in pieces that feature grids and angular forms. Hoffmann’s greatest works reflect his ability to combine seemingly conflicting design visions into coherent wholes. His architectural masterpiece, the Stoclet Palace in Brussels, has an exterior that groups together simple geometric forms and spacious interiors marked by subtly naturalistic design details that lend rooms an air of charm and geniality. Hoffmann’s signature furniture design is an adjustable lounge chair — the Sitzmaschine (1905) — that marries a curving frame with square and rectangular back- and side rests. This piece, like so many others by Hoffmann, reflects a groundbreaking, forward-thinking appreciation for the union of different looks and sources that marks the best of interior design in our own day. Moreover, items offered on these pages — which range from enameled silver jewelry, to a silver flower vase basket, to lighting pendants and sconces — testify to the astonishing breadth of Hoffman’s creative pursuits. He was truly a giant of design. Very elegant crystal-chandelier, the original chandelier is at the Cafe Sabarsky, Neue Galerie, New York. 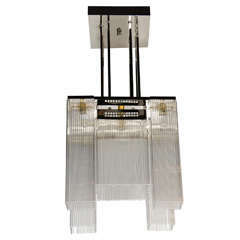 An elegant and delicate pendant designed by Josef Hoffmann. 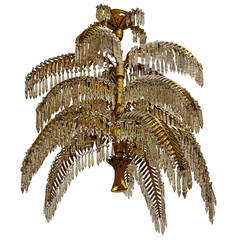 Beautiful ceiling lamp with Hand chased ornaments. 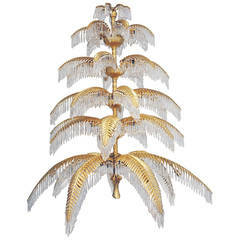 Great, splendid palm tree chandelier from Hoffmann-Bakalowitz. Vintage 1960s the size is particularly rare and spectacular.